Far to the northwest of Atlanta, a small studio. Started with 2 students and they still take from me to this day! Teaching all around Atlanta areas in student's homes, an active roster of 10 or more students at near all times. My own personal studio, ranging from one cello student at the beginning to now a wide roster of cellists, violinists, and violists, some in Honors Orchestra, community Orchestras, and their own chamber ensembles. My University's Symphony Orchestra rehearsed three times a week for two hours per session, and had a concert roughly every month. Cellist with the top symphony in the Youth program for several years. Playing a few songs for my Nephew's Preschool. Many of these you can learn in just a month or two! This is my fourth lesson with Nicholas. He is patient, explains each concept, and corrects me when I am making a mistake. Learning with him till now had been a very good experience. I hope to make good progress in the coming months. Thanks. Fantastic instructor, extremely patient and knowledgeable, highly recommend him. Nicholas is professional, knowledgeable and easy to talk to. I am excited about future lessons! Nicholas is a very professional and experienced teacher. I've learning cello from him about 4months for now and I found myself I enjoy the process a lot. Excellent experience for my son. Nicholas is filling in many gaps for him and laying a foundation for his future. Highly recommended! This was just our first lesson but Nicholas was great and the online format was easy and workable. There really is no need to be physically in the same room! I’ve taken lessons from Nicholas for about a month now, and he’s a fantastic instructor. As an adult beginner, I appreciate how patient he is and he explains technique/fundamentals in a way I can understan. I definitely feel challenged, and I leave each lesson wanting to practice for the next lesson. He’s also provided a lot of guidance for purchasing a cello and bow. Awesome experience so far. My son had a very good experience; we had some technical issues in the beginning and Nicholas was very patient and stayed on with us to ensure that my son didn’t miss out on the class. I would definitely recommend Nicholas to my friends and on my local neighborhood Facebook page thankyou! Nicholas was very detailed in his explanations, as well as, patient. he is very helpful and he makes me a better violinist. thank you for the lesson and now i know what i need to practice. went over where i left with last teacher. He also went over some foundational lessons . Nicholas is a great violin teacher. My son likes his teaching very much. Nicholas is very knowledge for the music he is teaching, and he provides great practice notes for every class. The practice notes is very helpful for my son. Just had one leason. Very good experience. He is a great instructor. He explains everything from the basic. I will continue my lessons. I was initially skeptical about taking online music lesson for my son. But Nicholas is very methodical and very attentive so that being online does not deter the lesson quality. Highly recommend him. He is very professional and knowledgeable, always on time for each lesson. He was able to help me improve from the first lesson. Nick is a very good teacher. I have been learning Violin from Nick for about 3 months now and things are progressing very well. I like the way Nick navigates through the lessons, by understanding the student's plus/minuses and progress. Nicholas is very helpful and accommodating. I'm trying to learn this instrument while in grad school and would not be able to do so if not for Nicholas. As an adult student, Nicholas is a fantastic instructor. He corrects technique rather than focusing on small mistakes (like a flubbed note). He's very easy to work with and challenges me each lesson so that I am never bored and never feel like I am wasting time working on perfecting a two note exercise because he pushes me to play further and further in the practice book. Absolutely the best experience for an adult student (any student, really). a lot attention to detail and technique when playing violin. Great for daughter because until now she has been all about rushing and getting it over with.. Now it will be more about taking time with each piece and aim for perfection. Even tho she is going over pieces she already played she's not complaining. Nick is an awesome instructor! Nicholas is such an amazing teacher! He is very thorough and makes sure that you understand and learn everything properly. He goes at a pace that is perfect for me and tailors to your specific needs. I look forward continuing my lessons and highly recommend him! Very friendly, knowledgably, easy going. I enjoyed the class and felt at ease. Can't wait for next weeks class. SO happy with my first class - instead of treating me like a beginning 8 year old (I'm almost 30), he willingly focused on technique and accepted my word that I have read music before (I played piano for several years) instead of forcing me to read a treble clef to him. He also immediately addressed my most pressing concerns (such as bow hold) as I am trying to partially self teach in the interest of time and money using online lessons, etc. Focusing on technique instead of how to pizzicato a quarter note allows me to practice and his teaching style, telling me what mistakes I may be making and why I am making them as a beginner (too much pressure, too little, etc) really allows me to try and improve before the next lesson. I am INCREDIBLY happy with his flexibility and teaching style and will gladly continue taking lessons from him. Highly recommend, at least for the adult beginners like myself! Nicholas is a wonderful teacher. He is very knowledgeable and patient. I have taken two lessons and look forward to many more. Nicholas is an excellent teacher. He made our daughter feel at ease almost immediately and that's not always the simplest thing to do. After one class, we are already seeing an improvement and she's a more confident cellist. Nicholas is an inspiring teacher who strives for excellence while focusing on the student's individual situation and needs. Beginning lessons as an adult with some musical experience with other instruments as a child and early teen, he has been able to build quickly on what I already knew, and "undo" improper technique which could have caused physical harm if continued. He is able to encourage and motivate in the difficult and frustrating moments common to all students. I highly recommend Nicholas for any age or level student. Nicholas began as my son's cello instructor when he was 10, and we are now beginning our third year under Nicholas' instruction. He has a very patient, quiet manner while teaching, though it is common to hear chuckles coming from the room during the lesson. Nicholas is himself an excellent musician, but he has very realistic expectations for his students. 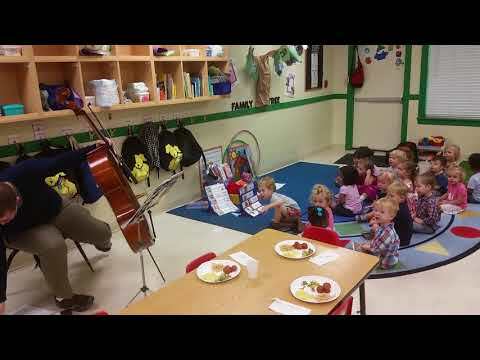 My son has made tremendous progress on the cello in a short time. Originally, we were in the same city with Nicholas, so the lessons occurred in our home. Recently, we moved out of state, and are thrilled that we can continue lessons with him online. Some of the things I have especially appreciated about him are his punctuality, being prompt and timely in his communications with us, and his willingness to work out scheduling details with us. Highly recommend Nicholas!